VP-J310AD1, Threadless Internal Cups, Tapered 1-1/8" to 1-1/4"
To run the forums, host the website, and travel, I charge a universal service fee for my reviews. 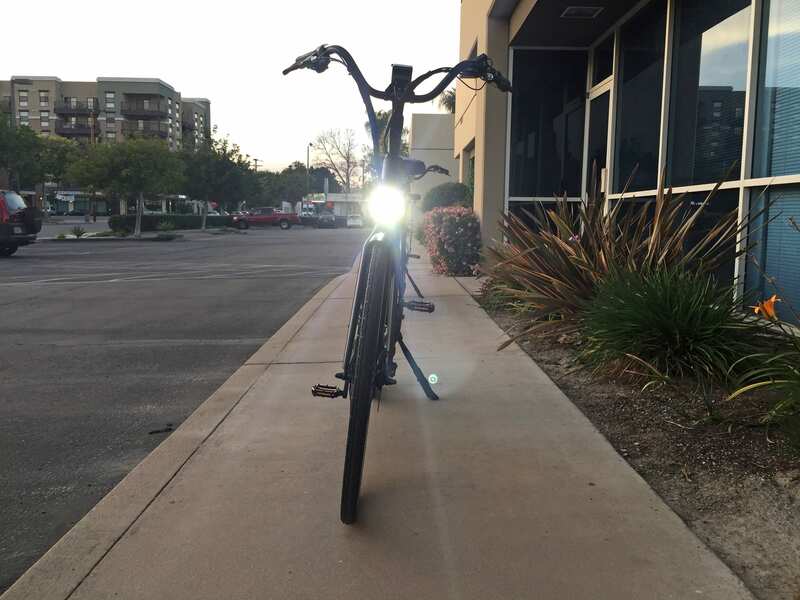 This review was sponsored by the Electric Bicycle Center which is based in in Fullerton, California. My goal is to be transparent and unbiased, this video and written review are not meant to be an endorsement of E-Lux products. 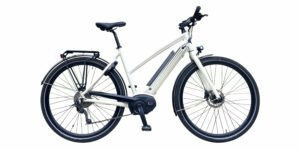 The E-Lux Monaco is a classy city cruiser electric bike available in two frame styles, dark and light color schemes with elegant pinstripes and understated branding, paint matched alloy fenders and an integrated light system with an alloy casing around the front light and a brake light that is activated by both brake levers. 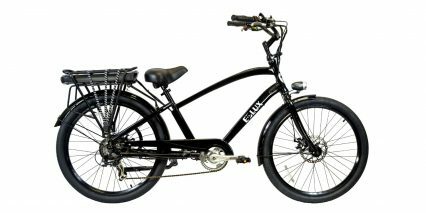 It has a sleek, sophisticated look with lots of attention to detail, including internally routed cables, and reflective tires for safety. 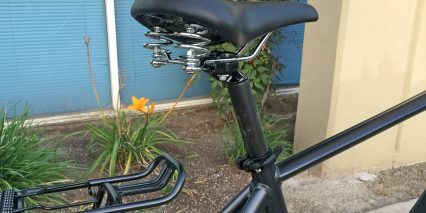 It does not offer any kind of sprung suspension, but the handlebar is swept back, the riser stem offers adjustable angle, and it comes with a spring saddle that feels pretty good. The Monaco offers a nice upright body position, so it feels pretty comfortable and allows you to enjoy your surroundings. 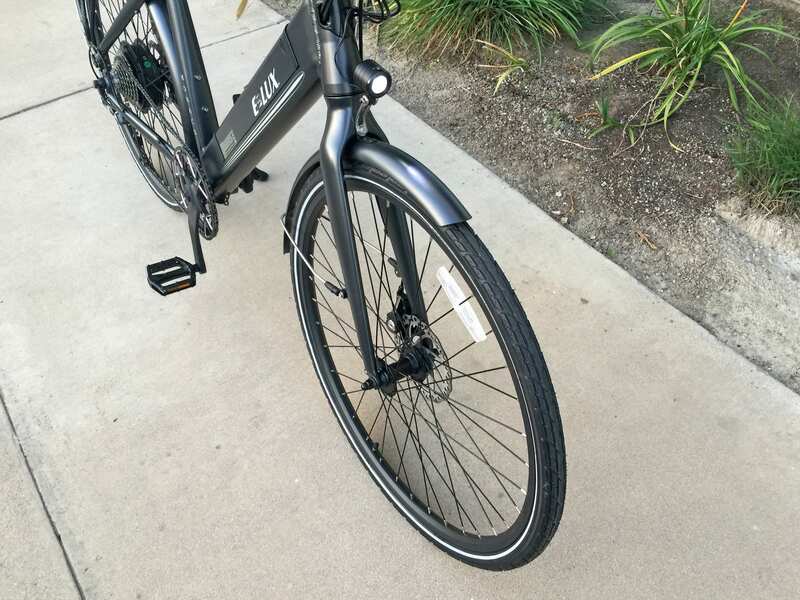 The high step model comes with 700c (28″) wheels, and the step through that I tested also had 700c wheels, though E-Lux is moving to a 26” wheel for the step through model, which will make mounting and dismounting easier for shorter riders, or riders with knee issues. 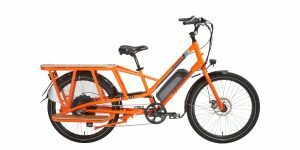 These are really efficient bikes, the high step frame provides a bit more stiffness than the step through, but both bikes feel really solid because of the multi-tube design, even to Sam (the owner of the bike shop in the video) who is a much larger 200+ pound rider. Thinner tires with a high PSI rating (50-85 PSI) offer efficiency, requiring less effort, and the 48 volt, 500 watt (750 peak) motor offers plenty of power. 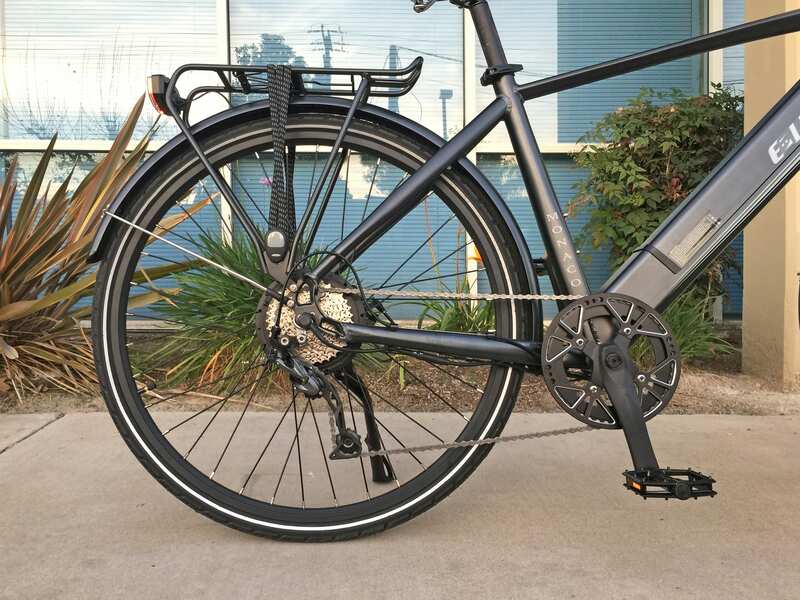 Everything is really well done on this bike and the alloy fenders and chain cover stayed fairly quiet compared to plastic, and with an MSRP of $1,995, it would make a great daily commuter or city cruiser. The Monaco weighs roughly 55lbs. 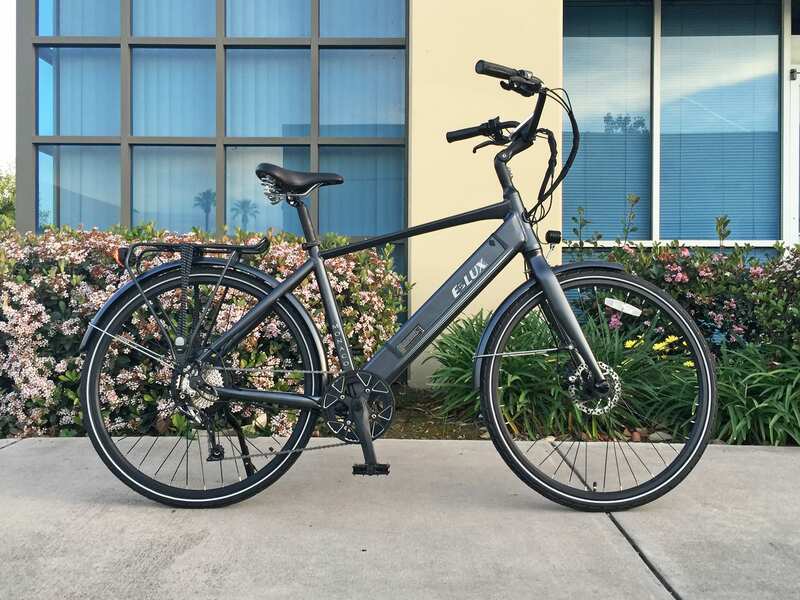 Not too bad for a value priced bike with fenders, a rack, integrated lights, and a high capacity battery. 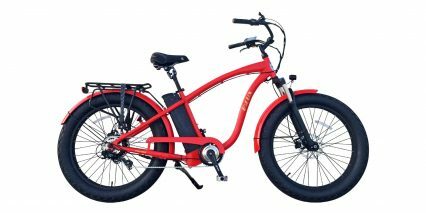 The company offers a one year warranty and excellent customer support, you can test ride them if you’re near a store that sells them. 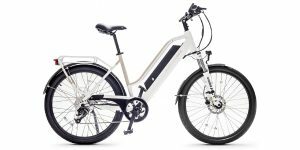 With all of these factors combined, you get peace of mind for what I would consider a value priced ebike. 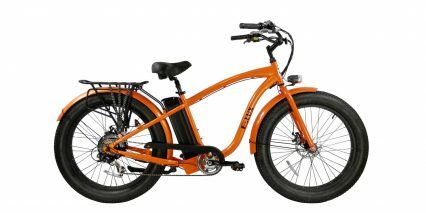 Powering the Monaco is a 500 watt Bafang brushless internally geared hub motor with a 750 watt peak. 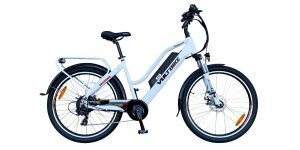 It’s a quieter motor than other Bafang motors I’ve tried, and with the 48 volt battery and five levels of pedal assist, it feels zippy and responsive. 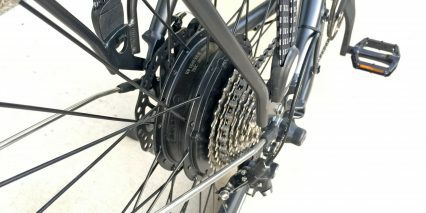 Hub motors are nice because they don’t interfere with shifting, geared motors don’t introduce any drag when coasting, and they tend to keep the overall price down. The bike also has a throttle mode which overrides pedal assist and ramps up smoothly and efficiently. The cadence sensor has an on/off feel, so the throttle override is nice and smooth by comparison, it gives you fine tuned control. 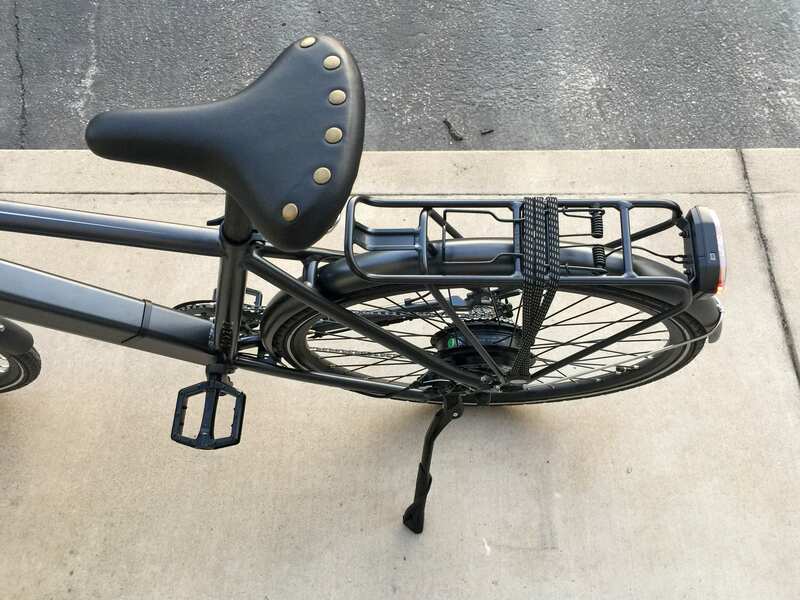 I like how the motor casing is black, matching the spokes and rims and crank set as well as the black VP platform pedals, which offer a wider surface area than standard pedals. 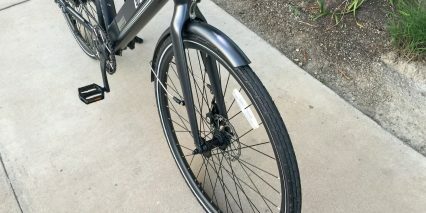 I also like how E-Lux uses thicker, 13 gauge spokes for added durability on the rear wheel. 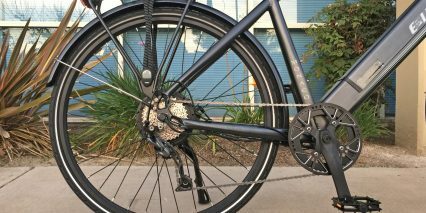 The drivetrain on the Monaco features a 48 tooth steel front chainring, which is stronger than alloy, though a bit heavier. 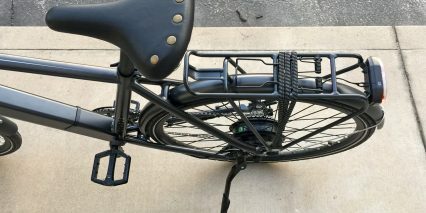 It has a nice alloy chainring guard to help protect your pants or a skirt from getting caught in the chain. It would be nice to see a double plate guard, to help keep the chain from bouncing off, but for a value priced bike this is still a pretty nice setup. 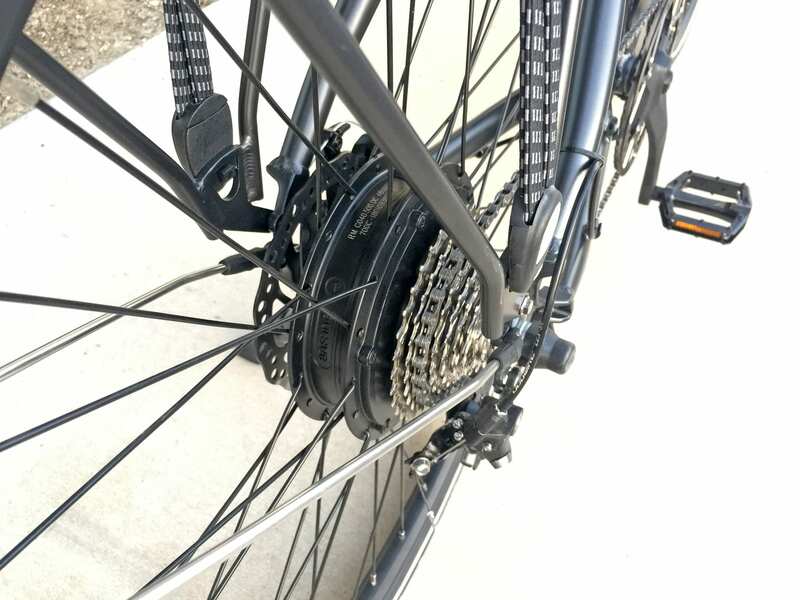 The bike features a 9 speed trigger shifter for easy shifting and a Shimano Altus rear derailleur with an 11-32 tooth cassette. Altus is one step up from entry level components, and should go longer without tuneups. You should have no problem climbing hills if you shift to a lower gear and gather some speed going in, and the bikes feel capable when cruising at higher speeds. 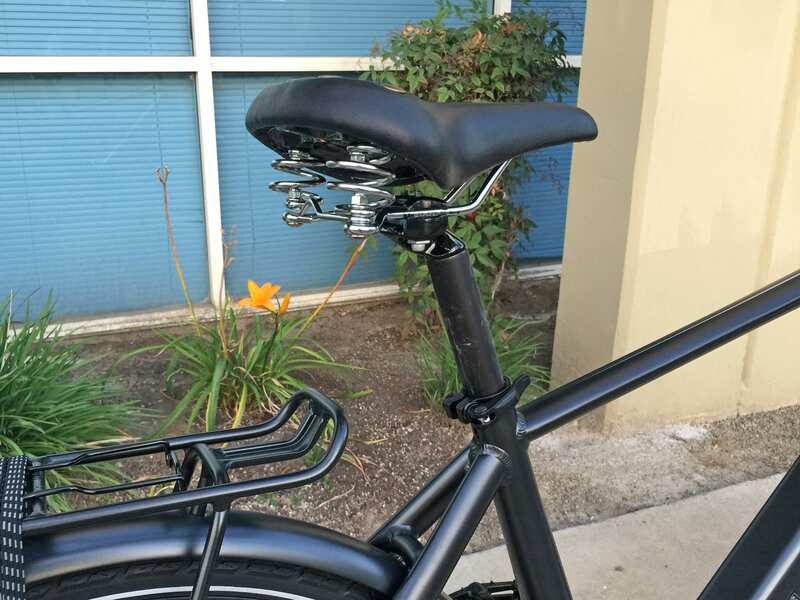 It would be nice to see a rear derailleur guard however, as it would protect the power cable if the bike tips over or gets hit by something while riding or while the bike is parked. And, if that motor cable is bent or cut, it could require expensive maintenance or even replacement. 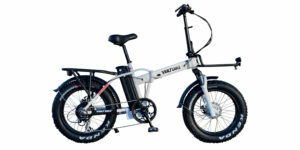 The brakes are 160mm Tektro mechanical discs, which require a little more hand strength to pull, but that’s part of the cost saving that helps this bike stay value priced. The nice things about these brakes are the rubber lined levers which both operate the brake light and have motor inhibitors to cut power when pulled. This is a nice upgrade for safety and a sense of control. There is also a nice little flick bell on the left side near the brake lever. I really like the sound and convenience of placement on this bell, as you can flick it without moving your hand away from the brake lever. 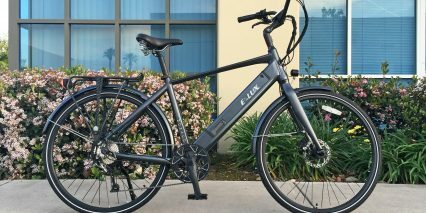 The Battery is a 48 volt, 10.5 amp hour, average capacity lithium-ion battery weighing roughly 5.5lbs. 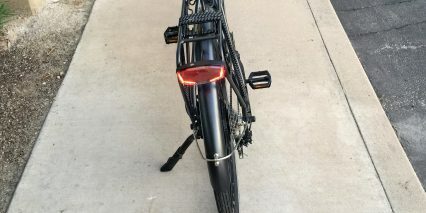 It has a built-in charge level indicator which lights up so you can see the battery level even when the control display is not turned on, or if you have the battery inside, away from the bike. 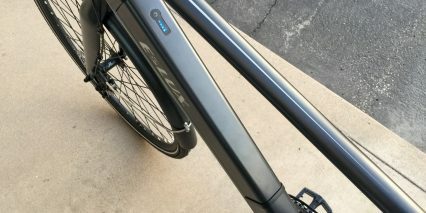 The placement of the battery is something that I especially like, it’s integrated into the downtube as opposed to sitting outside the frame like on some other value priced bikes. 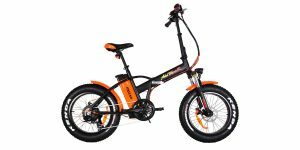 This keeps the battery safer and gives the bike a cleaner, more streamlined look. 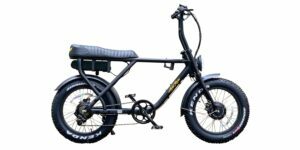 Combine that with the internally routed cables and the Monaco, at first glance, doesn’t really even look like an Ebike. I appreciate how the locking core and charging port on the battery are positioned high and out of the way, so they won’t interfere with the cranks or pedals. I also like that the battery can be charged on or off the bike. It is in a plastic casing, so be careful when you remove it as it’s easy to bump the top tube, which could cause some cracking that may alloy water or moisture to seep in. The removable feature allows you to store the battery inside during extreme heat or extreme cold. Remember to top the battery off every month or so if you’re not riding the bike, and try not to let it drop below 20% charge if you can help it. This will help extend the life of your battery, which is one of the most expensive parts of an Ebike to replace. The control pad is fairly easy to reach, mounted right next to the trigger throttle near the left grip. When you’re ready to go, the display comes to life quickly by pressing the power button. 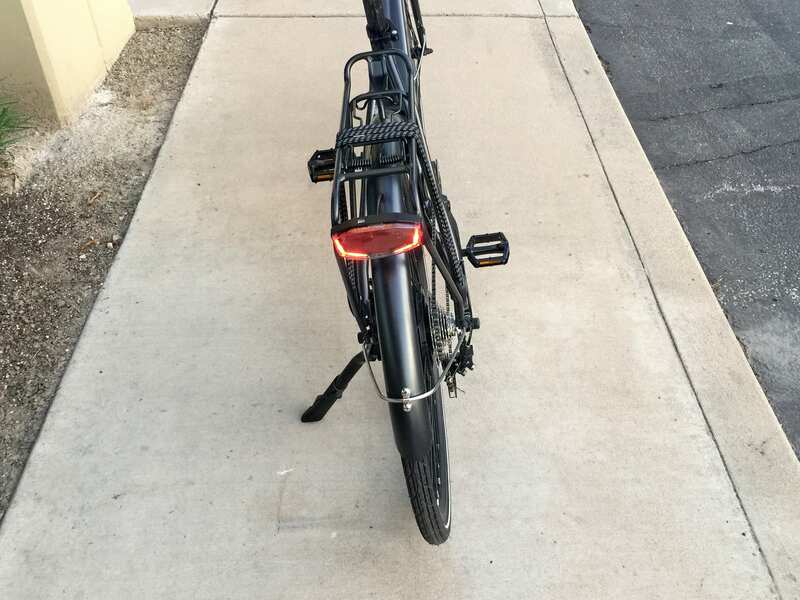 You turn on the backlight by by tapping the power button once, which also activates the headlight and taillight. The top left of the display shows the BMS, or battery management system, with voltage and a five tick battery life info-graphic. The five ticks represent 20% increments, try not to let the battery get below one tick as it can start to stress the cells and also be difficult to tell how close you are to running completely out. 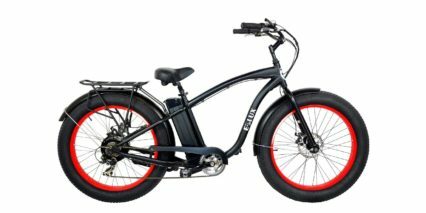 It’s no fun to pedal home with a heavy ebike, even if it does have the efficient tires and freewheeling hub motor. 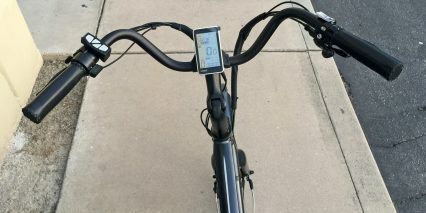 The upper right of the display shows the power ramp meter. The large, middle section of the display shows the light icon and your speed, in either MPH or KPH. 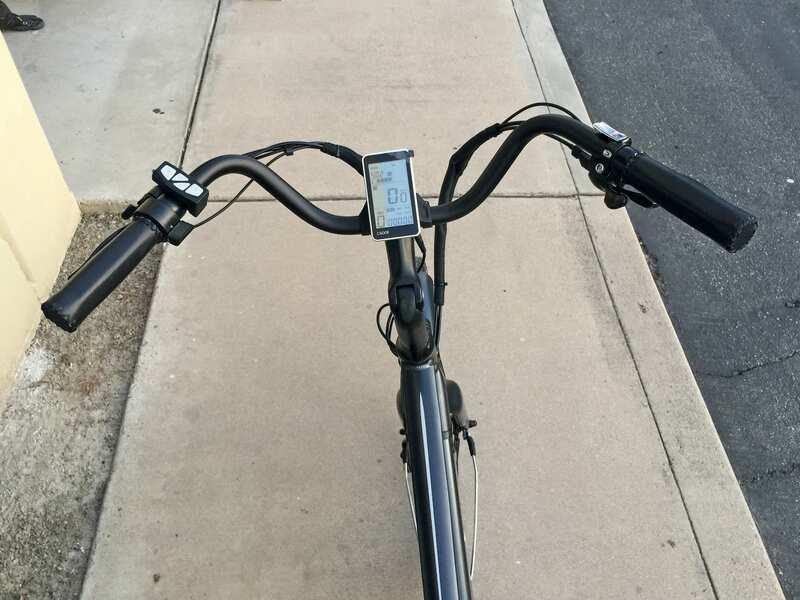 The bottom left is your PAS, or pedal assist mode display. Arrow up and down to change assist levels. The bottom right of the display shows the time, and has two trip odometers. 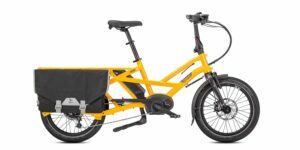 This is unusual for an ebike, but could come in handy if you want to measure your distance to work, minus a stop off at the post office or some other out of the way place. Holding set for a few seconds pulls up the settings menu, where you can reset the trip meters, change top speed, wheel size, MPH to KPH, etc. Hold set again to exit the menus. The display doesn’t rotate but there is a USB port built in for charging portable electronics. Finally, the charger for the battery pack is an average 2 amp charger weighing about 1.5lbs. It’s small enough and light enough to carry with you though, so you can charge your battery while at work. E-Lux is a well established company based in Southern California that’s been around for a long time. 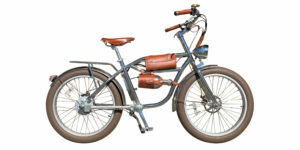 All of their electric bikes are designed for comfort as well as efficiency. 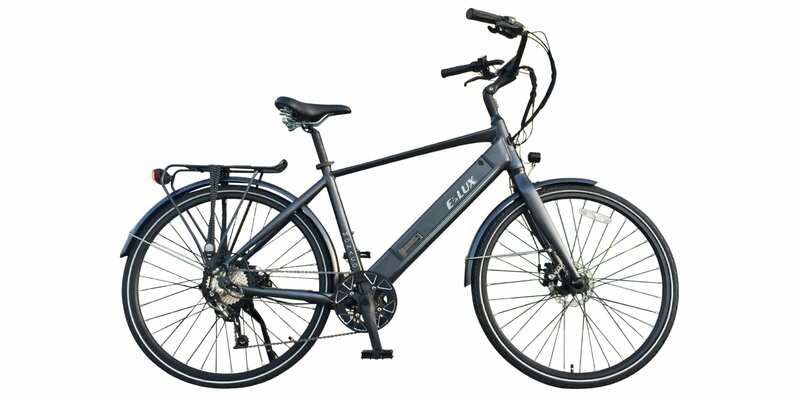 In fact, as you can see in the video, Sam told me that E-Lux, which stands for Electric Luxury, claims to have the most comfortable bikes on the market. 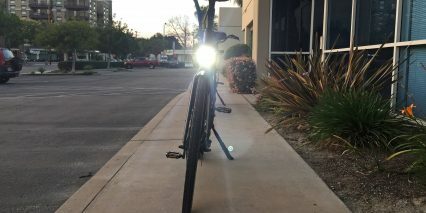 Both frame styles that I rode were comfortable, and with the paint matched alloy fenders, integrated light system, and alloy rack, which is bolted onto the fender to eliminate unsightly silver mounting brackets, this bike makes for an excellent commuter that combines efficiency with comfort and style. Another feature I appreciate about this bike is the tapered head tube. One of the main advantages of using such type of tubing is increased stiffness, as a tapered tube is more rigid than a straight cylindrical one, offering increased cornering precision and increased feedback while riding. 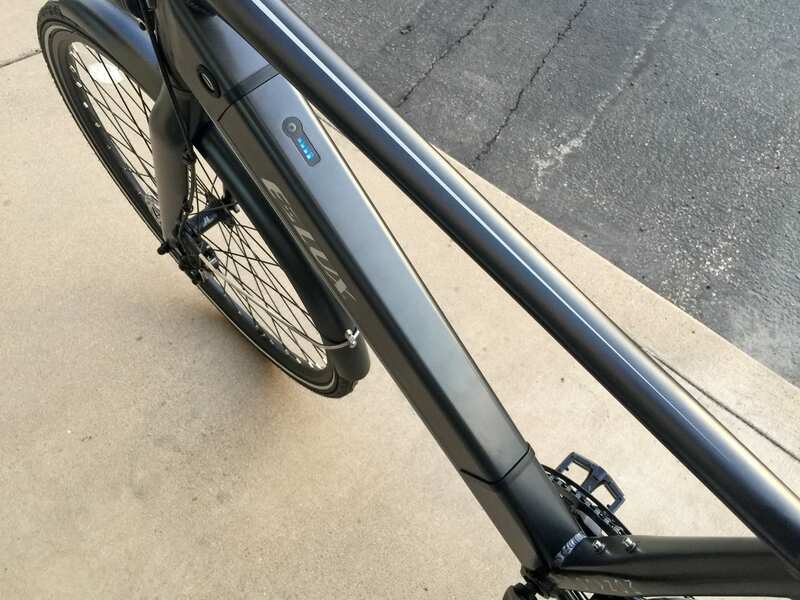 This is a nice safety upgrade for a value priced ebike that allows a rider more control, especially while cornering at higher speeds, or dipping into and out of traffic while commuting. It’s also easier to upgrade to a fancy suspension fork if you decide to do that down the line. 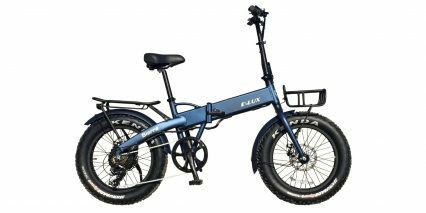 All in all this is a well thought out value priced Ebike with lots of attention to detail, and backed by a reputable company, but I always appreciate your feedback and opinions in the comments below or welcome you to engage and share pictures and make friends in the E-Lux forums.